This article is about the 1954 film. For other films titled Godzilla, see Godzilla (disambiguation). Godzilla (ゴジラ, Gojira)[Note 1] is a 1954 Japanese kaiju film featuring Godzilla, produced and distributed by Toho. It is the first film in the Godzilla franchise and Shōwa series. The film is directed by Ishirō Honda, with special effects by Eiji Tsuburaya. The film stars Akira Takarada, Momoko Kōchi, Akihiko Hirata, Takashi Shimura, with Haruo Nakajima and Katsumi Tezuka as the performers for Godzilla. Godzilla entered production after a Japanese-Indonesian co-production collapsed. Tsuburaya originally opted for a giant octopus before the filmmakers decided on a dinosaur-inspired creature. Godzilla pioneered a form of special effects called suitmation, in which a stunt actor wearing a suit crushes a miniature set. Principal photography lasted 51 days and special effects lasted 71 days. Godzilla was released in Nagoya on October 27, 1954, and released throughout Japan on November 3, 1954, and grossed ¥183 million during its initial theatrical run. In 1956, a heavily re-edited "Americanized" version was released in the United States. The film spawned a multimedia franchise, being recognized by Guinness World Records as the longest running film franchise in history. Godzilla has since become an international pop culture icon and the film has been largely credited for establishing the template for Tokusatsu. When the Japanese freighter Eiko-maru is destroyed near Odo Island, another ship – the Bingo-maru – is sent to investigate, only to meet the same fate with few survivors. A fishing boat from Odo is also destroyed, with one survivor. Fishing catches mysteriously drop to zero, blamed by an elder on the ancient sea creature known as "Godzilla". Reporters arrive on Odo Island to further investigate. A villager tells one of the reporters that something in the sea is ruining the fishing. That evening, a storm strikes the island, destroying the reporters' helicopter, and Godzilla, though very briefly seen, destroys 17 homes, kills nine people and 20 of the villagers' livestock. Odo residents travel to Tokyo to demand disaster relief. The villagers' and reporters' evidence describes damage consistent with something large crushing the village. The government sends paleontologist Kyohei Yamane to lead an investigation on the island, where giant radioactive footprints and a trilobite are discovered. The village alarm bell is rung and Yamane and the villagers rush to see the monster, retreating after seeing that it is a giant dinosaur. Yamane presents his findings in Tokyo, estimating that Godzilla is 50 metres (164 ft) tall and is evolved from an ancient sea creature becoming a terrestrial animal. He concludes that Godzilla has been disturbed from its deep underwater natural habitat by underwater hydrogen bomb testing. Debate ensues about notifying the public about the danger of the monster. Meanwhile, 17 ships are lost at sea. Ten frigates are dispatched to attempt to kill the monster using depth charges. The mission disappoints Yamane who wants Godzilla to be studied. Having survived the attack, officials appeal to Yamane for ideas to kill the monster, but Yamane tells them that Godzilla is unkillable, having survived H-bomb testing, and must be studied. Yamane's daughter, Emiko, decides to break off her arranged engagement to Yamane's colleague, Daisuke Serizawa, because of her love for Hideto Ogata, a salvage ship captain. When a reporter arrives and asks to interview Serizawa, Emiko escorts the reporter to Serizawa's home. After Serizawa refuses to divulge his current work to the reporter, he gives Emiko a demonstration of his recent project on the condition she must keep it a secret. The demonstration horrifies her and she leaves without breaking off the engagement. Shortly after she returns home, Godzilla surfaces from Tokyo Bay and attacks Shinagawa. After attacking a passing train, Godzilla returns to the ocean. After consulting with international experts, the Japanese Self-Defense Forces construct a 30-metre-tall (100 ft), 50,000 volt electrified fence along the coast and deploy forces to stop and kill Godzilla. Yamane returns home, dismayed that there is no plan to study Godzilla for its resistance to radiation, where Emiko and Ogata await hoping to get his consent for them to wed. When Ogata disagrees with Yamane, arguing the threat Godzilla poses outweighs any potential benefits from studying the monster, Yamane tells him to leave. Godzilla resurfaces and breaks through the fence to Tokyo with its atomic breath, unleashing more destruction across the city. Further attempts to kill the monster with tanks and fighter jets fail and Godzilla returns to the ocean. The day after, hospitals and shelters are crowded with the maimed and the dead, with some survivors suffering radiation sickness. Distraught by the devastation, Emiko tells Ogata about Serizawa's research, a weapon called the "Oxygen Destroyer", which disintegrates oxygen atoms and the organisms die of a rotting asphyxiation. Emiko and Ogata go to Serizawa to convince him to use the Oxygen Destroyer but he initially refuses. After watching a program displaying the nation's current tragedy, Serizawa finally accepts their pleas. As Serizawa burns his notes, Emiko breaks down crying. A navy ship takes Ogata and Serizawa to plant the device in Tokyo Bay. After finding Godzilla, Serizawa unloads the device and cuts off his air support, taking the secrets of the Oxygen Destroyer to his grave. Godzilla is destroyed but many mourn Serizawa's death. Yamane believes that if nuclear weapons testing continues, another Godzilla may rise in the future. In the film, Godzilla symbolizes nuclear holocaust from Japan's perspective and has since been culturally identified as a strong metaphor for nuclear weapons. Producer Tomoyuki Tanaka stated that, "The theme of the film, from the beginning, was the terror of the bomb. Mankind had created the bomb, and now nature was going to take revenge on mankind." Director Ishirō Honda filmed Godzilla's Tokyo rampage to mirror the Atomic bombings of Hiroshima and Nagasaki, stating, "If Godzilla had been a dinosaur or some other animal, he would have been killed by just one cannonball. But if he were equal to an atomic bomb, we wouldn't know what to do. So, I took the characteristics of an atomic bomb and applied them to Godzilla." Academics Anne Allison, Thomas Schnellbächer, and Steve Ryfle have stated that Godzilla contains political and cultural undertones that can be attributed to what the Japanese had experienced in World War II and that Japanese audiences were able to connect emotionally to the monster. They theorized that these viewers saw Godzilla as a victim and felt that the creature's backstory reminded them of their experiences in World War II. These academics have also claimed that as the atomic bomb testing that woke Godzilla was carried out by the United States, the film in a way can be seen to blame the United States for the problems and struggles that Japan experienced after World War II had ended. They also felt that the movie could have served as a cultural coping method to help the people of Japan move on from the events of the war. Brian Merchant from Motherboard called the film "a bleak, powerful metaphor for nuclear power that still endures today" and on its themes, he stated: "It's an unflinchingly bleak, deceptively powerful film about coping with and taking responsibility for incomprehensible, manmade tragedy. Specifically, nuclear tragedies. It's arguably the best window into post-war attitudes towards nuclear power we've got—as seen from the perspective of its greatest victims." Terrence Rafferty from The New York Times stated Godzilla was "an obvious gigantic, unsubtle, grimly purposeful metaphor for the atomic bomb" and felt the film was "extraordinarily solemn, full of earnest discussions". Mark Jacobson from the website of New York magazine stated that Godzilla "transcends humanist prattle. Very few constructs have so perfectly embodied the overriding fears of a particular era. He is the symbol of a world gone wrong, a work of man that once created cannot be taken back or deleted. He rears up out of the sea as a creature of no particular belief system, apart from even the most elastic version of evolution and taxonomy, a reptilian id that lives inside the deepest recesses of the collective unconscious that cannot be reasoned with, a merciless undertaker who broaches no deals." Regarding the film, Jacobson stated, "Honda’s first Godzilla... is in line with these inwardly turned post-war films and perhaps the most brutally unforgiving of them. Shame-ridden self-flagellation was in order, and who better to supply the rubber-suited psychic punishment than the Rorschach-shaped big fella himself?" Tim Martin from The Daily Telegraph (London) stated that the original 1954 film was "a far cry from its B-movie successors. It was a sober allegory of a film with ambitions as large as its thrice-normal budget, designed to shock and horrify an adult audience. Its roster of frightening images — cities in flames, overstuffed hospitals, irradiated children — would have been all too familiar to cinemagoers for whom memories of Hiroshima and Nagasaki were still less than a decade old, while its script posed deliberately inflammatory questions about the balance of postwar power and the development of nuclear energy." Martin also commented how the film's themes were omitted in the American version, stating, "Its thematic preoccupation with nuclear energy proved even less acceptable to the American distributors who, after buying the film, began an extensive reshoot and recut for Western markets." In 1954, Toho originally planned to produce Eiko-no Kagi-ni (In the Shadow of Glory), a Japanese-Indonesian co-production about the aftermath of the Japanese occupation of Indonesia, however, anti-Japanese sentiment in Indonesia forced political pressure on the government to deny visas for the Japanese filmmakers. Producer Tomoyuki Tanaka flew to Jakarta to renegotiate with the Indonesian government but was unsuccessful and on the flight back to Japan, conceived the idea for a giant monster film inspired by the film The Beast from 20,000 Fathoms (1953) and the Daigo Fukuryū Maru incident that happened March of that year. During his flight, Tanaka wrote an outline with the working title The Giant Monster from 20,000 Leagues Under The Sea and pitched it to executive producer Iwao Mori. Mori approved the project in April 1954 after special effects director Eiji Tsuburaya agreed to do the film's effects and confirmed that the film was financially feasible. Mori also felt the project was a perfect vehicle for Tsuburaya and to test the storyboarding system that he instituted at the time. Mori also approved Tanaka's choice to have Ishirō Honda direct the film and shortened the title of the production to Project G (G for Giant), as well as giving the production classified status and ordered Tanaka to minimize his attention on other films and mainly focus on Project G.
Tsuburaya submitted an outline of his own, written three years before; it featured a giant octopus attacking ships in the Indian ocean. In May 1954, Tanaka hired sci-fi writer Shigeru Kayama to write the story. Only 50 pages long and written in 11 days, Kayama's treatment depicted Dr. Yamane wearing dark shades, a cape and living in a European-style house from which he only emerged at night. Godzilla was portrayed as more animal-like by coming ashore to feed on animals, with an ostensibly gorilla-like interest in females. Kayama's story treatment also featured less destruction and borrowed a scene from The Beast from 20,000 Fathoms by having Godzilla attack a lighthouse. Takeo Murata and director Ishiro Honda co-wrote the screenplay in three weeks, confining themselves in a Japanese Inn in Tokyo's Shibuya ward. On writing the script, Murata stated, "Director Honda and I... racked our brains to make Mr. Kayama's original treatment into a full, working vision." Murata stated that Tsuburaya and Tanaka also pitched their ideas as well. Tanaka requested that they do not spend too much money while Tsuburaya encouraged them to "do whatever it takes to make it work". Murata and Honda redeveloped key characters and elements by adding the Emiko-Ogata-Serizawa love triangle, while in Kayama's treatment, Serizawa was depicted as merely a colleague of Dr. Yamane's. In Kayama's treatment, Godzilla's full appearance was to be revealed during the Odo Island hurricane but Honda and Murata instead opted to hold back on revealing Godzilla by simply showing parts of the creature as the film built up to his full reveal. Honda and Murata also introduced the characters Hagiwara and Dr. Tanabe in their draft but the role of Shinkichi, who had a substantial role in Kayama's treatment, was cut down. The filmmakers took inspiration from various dinosaurs to shape Godzilla's final iconic design. Godzilla was designed by Teizo Toshimitsu and Akira Watanabe under Eiji Tsuburaya's supervision. Early on, Tanaka contemplated on having the monster be gorilla-like or whale-like in design due to the name "Gojira" (a combination of the Japanese words for gorilla, gorira, and whale, kujira) but eventually settled on a dinosaur-like design. Kazuyoshi Abe was hired earlier to design Godzilla but his ideas were later rejected due to Godzilla looking too humanoid and mammalian, with a head shaped like a mushroom cloud, however Abe was retained to help draw the film's storyboards. Toshimitsu and Watanabe decided to base Godzilla's design on dinosaurs and, by using dinosaur books and magazines as a reference, combined elements of a Tyrannosaurus, Iguanodon and the dorsal fins of a Stegosaurus. Despite wanting to have utilized stop motion animation, Tsuburaya reluctantly settled on suitmation. Toshimitsu sculpted three clay models on which the suit would be based. The first two were rejected but the third was approved by Tsuburaya, Tanaka, and Honda. The Godzilla suit was constructed by Kanji Yagi, Koei Yagi, and Eizo Kaimai, who used thin bamboo sticks and wire to build a frame for the interior of the suit and added metal mesh and cushioning over it to bolster its structure and finally applied coats of latex. Coats of molten rubber were additionally applied, followed by carved indentations and strips of latex glued onto the surface of the suit to create Godzilla's scaly hide. This first version of the suit weighed 100 kilograms (220 pounds). For close-ups, Toshimitsu created a smaller scale, mechanical, hand-operated puppet that sprayed streams of mist from its mouth to act as Godzilla's atomic breath. Haruo Nakajima and Katsumi Tezuka were chosen to perform in the Godzilla suit, due to their strength and endurance. At the first costume fitting, Nakajima fell down while inside the suit, due to the heavy latex and inflexible materials used to create the suit. This first version of the suit was cut in half and used for scenes requiring only partial shots of Godzilla or close-ups, with the lower-half fitted with rope suspenders for Nakajima to wear. A second identical suit was created for full-body shots, which was made lighter than the first suit but Nakajima was still only able to be inside for three minutes before passing out. Nakajima lost 20 pounds during the production of the film. Nakajima would go on to portray Godzilla and other monsters until his retirement in 1972. Tezuka filmed scenes in the Godzilla suit but due to his older body, he was unable to fully commit to the physical demands required of the role. As a result, few of his scenes made it to the final cut as very few scenes were considered usable. Tezuka filled in for Nakajima when he was unavailable or needed relief from the physically demanding role. Godzilla's name was also a source of consternation for the filmmakers. 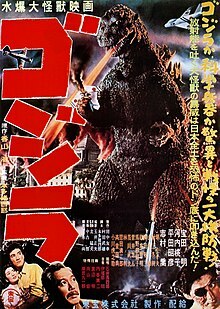 Because the monster had no name, the first draft of the film was not called Gojira but rather titled G, also known as Kaihatsu keikaku G ("Development Plan G"), the "G" of the title stood for "Giant", however. Nakajima confirmed that Toho held a contest to name the monster. The monster was eventually named Gojira, a combination of the Japanese words gorira (gorilla) and kujira (whale). One explanation that is chalked up to legend is that a hulking Toho Studios employee's physical attributes led him to be nicknamed Gojira. In a 1998 BBC documentary on Godzilla, Kimi Honda, the widow of the director, dismissed the employee-name story as a tall tale, believing that Honda, Tanaka, and Tsuburaya gave "considerable thought" to the name of the monster, stating, "the backstage boys at Toho loved to joke around with tall stories, but I don't believe that one". Tsuburaya originally wanted to use stop motion for the film's special effects but realized it would have taken seven years to complete based on the then-current staff and infrastructure at Toho. Settling on suitmation and miniature effects, Tsuburaya and his crew scouted the locations Godzilla was to destroy and were nearly arrested after a security guard overheard their plans for destruction but were released after showing police their Toho business cards. Kintaro Makino, the chief of miniature construction, was given blueprints by Akira Watanabe for the miniatures and assigned 30 to 40 workers from the carpentry department to build them, which took a month to build the scaled down version of Ginza. A majority of the miniatures were built at 1:25 scale but the Diet building was scaled down to a 1:33 scale to look smaller than Godzilla. The buildings' framework were made of thin wooden boards reinforced with a mixture of plaster and white chalk. Explosives were installed inside miniatures that were to be destroyed by Godzilla's atomic breath while some were sprayed with gasoline to make them burn more easily; others included small cracks so they could crumble easily. Optical animation techniques were used for Godzilla's glowing dorsal fins by having hundreds of cells drawn frame-by-frame. Haruo Nakajima perspired inside the suit so much that the Yagi brothers had to dry out the cotton lining every morning and sometimes re-line the interior of the suit and repair damages. The special effects crew spent 71 days on filming. Most of the film was shot in the Toho lot. Honda's team also filmed on location in the Shima Peninsula in Mie Prefecture to film the Odo Island scenes, which used 50 Toho extras and Honda's team establishing their base in the town of Toba. Toho had negotiated with the Japan Self-Defense Forces to film scenes requiring the military and filmed target practices and drills for the film; Honda's team followed a convoy of JSDF vehicles for convoy dispatch scene. 2,000 girls were used from an all-girls high school for the prayer for peace scene. Honda's team spent 51 days shooting the film. Rialto Pictures' poster for the 2004 U.S release of Godzilla. Godzilla was first released in Nagoya on October 27, 1954, and a week later, released throughout Japan on November 3, 1954. It sold approximately 9,610,000 tickets and was the eighth best-attended film in Japan that year. It remains the second most-attended "Godzilla" film in Japan, behind King Kong vs. Godzilla. The film grossed ¥183 million during its initial theatrical run in Japan. In 1957, the film was released in France, where it drew 835,511 box office admissions. The film's limited North American re-releases in the early 21st century grossed $562,711, with the 2004 release grossing $412,520, and the 2014 release grossing $150,191. In 1955 and in the 1960's, Godzilla played in theaters catering to Japanese-Americans in predominantly Japanese neighborhoods in the United States. An English subtitled version was shown at film festivals in New York, Chicago, and other cities in 1982. To coincide with Godzilla's 50th anniversary, art-house distributor Rialto Pictures gave the film a traveling tour-style limited release, coast-to-coast, across the United States, on May 7, 2004. It ran uncut with English subtitles until December 19, 2004. Starting out in only two theaters, the film grossed $38,030 in its opening weekend. It never played on more than six screens at any given point during its limited release. By the end of its 2004 run, it had grossed $412,520. The film played in roughly sixty theaters and cities across the United States during its ​7 1⁄2-month release. On April 18, 2014, Rialto re-released the film in the United States, coast-to-coast, using another limited-style traveling tour. This coincided with not only Godzilla's 60th anniversary, but also celebrated the American Godzilla film which was released that same year. To avoid confusion with the Hollywood feature, the Rialto release was subtitled The Japanese Original. The film opened with a $10,903 gross while playing on only one screen in New York City. It when on to play in roughly 66 theaters in 64 cities from April 18 to October 31, 2014. After its 7 month run, the film grossed $150,191. Initially, the film received mixed to negative reviews in Japan. Japanese critics accused the film of exploiting the widespread devastation that the country had suffered in World War II, as well as the Daigo Fukuryū Maru (Lucky Dragon) incident that occurred a few months before filming began. Ishiro Honda lamented years later in the Tokyo Journal, "They called it grotesque junk, and said it looked like something you'd spit up. I felt sorry for my crew because they had worked so hard!". Honda also stated "At the time they wrote things like 'This movie is absurd, because such giant monsters do not exist.'" Others said that depicting a fire breathing organism was "strange." Honda also believed Japanese critics began to change their minds after the good reviews the film received in the United States. He stated "The first film critics to appreciate Godzilla were those in the U.S. When Godzilla was released there as Godzilla, King of the Monsters! in 1956, the critics said such things as, 'For the start, this film frankly depicts the horrors of the Atomic Bomb. ', and by these evaluations, the assessment began to impact critics in Japan and has changed their opinions over the years." As time went on, the film gained more respect in its home country. In 1984, Kinema Junpo magazine listed Godzilla as one of the top 20 Japanese films of all time, while a survey of 370 Japanese movie critics published in Nihon Eiga Besuto 150 (Best 150 Japanese Films), had Godzilla ranked as the 27th best Japanese film ever made. The film was nominated for two Japanese Movie Association awards. One for best special effects and the other for best film. It won best special effects but lost best picture to Akira Kurosawa's Seven Samurai. The film was re-released theatrically in Japan on November 21, 1982, as part of Toho's 50th anniversary. On review aggregator website Rotten Tomatoes, the film has a 93% approval rating based on 70 reviews, with an average score of 7.7/10. The site's consensus states: "More than straight monster-movie fare, Gojira offers potent, sobering postwar commentary". On Metacritic, which assigns a weighted average based on selected critic reviews, the film has a score of 78/100, based on 20 critics, indicating "generally favorable reviews". "Godzilla, an ancient beast roused from the ocean depths and irradiated by Japanese H-bomb tests, reduces Tokyo to a pile of ash, yet, like Kong, he grows more sympathetic as his rampage goes on. The characters talk about him not as an enemy but as a force of destiny, a "god". The inescapable subtext is that Japan, in some bizarre way, deserves this hell. Godzilla is pop culture's grandest symbol of nuclear apocalypse, but he is also the primordial spirit of Japanese aggression turned, with something like fate, against itself". "A lot of people are likely to be surprised by what they see. The 1954 Japanese cut is shot like a classic film noir, and the buildup to Tokyo's inevitable thrashing is quite slow by today's standards. The echoes of World War II are very strong, and the devastation wrought by Godzilla (played by Haruo Nakajima) is not sugar-coated; it eerily mirrors that of Hiroshima and Nagasaki, and the deaths and injuries are dwelt upon. The monster himself is not fully revealed for quite a while, and even when he finally shows up, he's a malevolent black predator with glistening skin, who stays mostly in the shadows, many times more fearsome than the green-skinned cookie monster who showed up in the various sequels to layeth the smacketh down on the candyasses of numerous alien invaders in ugly leotards". "In these days of flawless special effects, Godzilla and the city he destroys are equally crude. Godzilla at times looks uncannily like a man in a rubber suit, stomping on cardboard sets, as indeed he was, and did. Other scenes show him as a stuffed, awkward animatronic model. This was not state-of-the-art even at the time; King Kong (1933) was much more convincing. When Dr. Serizawa demonstrates the Oxygen Destroyer to his fiancee, Emiko [sic], the super weapon is somewhat anticlimactic. He drops a pill into a tank of tropical fish, the tank lights up, he shouts, "stand back! ", the fiancée screams, and the fish go belly-up. Yeah, that'll stop Godzilla in his tracks". Since its release, Godzilla has been regarded not only as one of the best giant monster films ever made but an important cinematic achievement. The film was ranked #31 in Empire magazine's "The 100 Best Films Of World Cinema" in 2010. In 2015, Variety named it among the "10 Best Monster Movies of All-Time". The 1956 Godzilla, King of the Monsters! version of the film was released on DVD by Simitar in 1998 and Classic Media in 2002. A DVD of the original Japanese version of the film was released in Japan in 2002. The quality of the print used for the Japanese version was partially restored and remastered, including three audio tracks (the original mono track, an isolated audio track, and an isolated track and special effects track), and an interview with Akira Ifukube. In 2006, Classic Media and Sony BMG Music Entertainment Home Entertainment released a two-disc DVD set titled Gojira: The Original Japanese Masterpiece. This release features both the original 1954 Japanese Gojira film and the 1956 American Godzilla, King of the Monsters! version, making the original Japanese version of the film available on DVD in North America for the first time. This release features theatrical trailers for both films, audio commentary tracks on both films with Godzilla scholars Steve Ryfle (author of Japan’s Favorite Mon-Star: The Unauthorized Biography of the Big G) and Ed Godziszewski (editor of Japanese Giants Magazine), two 13-minute documentaries titled "Godzilla Story Development" and "Making of the Godzilla Suit," and a 12-page essay booklet by Steve Ryfle. This release also restores the original ending credits of the American film which, until recently, were thought to have been lost. In the fall of 2005, BFI released the original Japanese version in the UK theatrically, and later in the same year on DVD. The DVD includes the original mono track and several extra features, such as documentaries and commentary tracks by Steve Ryfle, Ed Godziszewski, and Keith Aiken. The DVD also includes a documentary about the Daigo Fukuryu Maru, a Japanese fishing boat that was caught in an American nuclear blast and partially inspired the creation of the movie. A region-4 DVD was released in Australia by Madman Co. Ltd in 2004 for the film's 50th Anniversary. In 2009, Classic Media released Godzilla on Blu-ray. This release includes the same special features from the 2006 Classic Media DVD release, but does not feature the 1956 American version. On January 24, 2012, The Criterion Collection released a "new high-definition digital restoration" of Godzilla on Blu-ray and DVD. This release includes a remaster of the 1956 American version, Godzilla, King of the Monsters, as well as other special features such as interviews with Akira Ikufube, Japanese film critic Tadao Sato, actor Akira Takarada, Godzilla performer Haruo Nakajima, effects technicians Yoshio Irie and Eizo Kaimai and audio commentaries on both films by David Kalat, author of A Critical History and Filmography of Toho’s Godzilla Series. Main article: Godzilla, King of the Monsters! American theatrical poster for Godzilla, King of the Monsters! Following the film's success in Japan, Toho sold the American rights to Joseph E. Levine for $25,000. A heavily altered version of the film was released in the United States and worldwide as Godzilla, King of the Monsters! on April 27, 1956. This version trimmed the original down to 80 minutes and featured new footage with Canadian actor Raymond Burr interacting with body doubles mixed with Honda's footage to make it seem like he was part of the original Japanese production. Many of the film's political themes were trimmed or removed completely. It was this version of the original Godzilla film that introduced audiences worldwide to the character and franchise and the only version that critics and scholars had access to until 2004 when the 1954 film was released in select theaters in North America. Godzilla, King of the Monsters grossed $2 million during its theatrical run, more than what the 1954 film grossed in Japan. Honda was unaware that Godzilla had been re-edited until Toho released Godzilla, King of the Monsters in Japan in May 1957 as Monster King Godzilla. Toho converted the entire film from its original scope to a widescreen 2.35:1 scope, which resulted in an awkward crop for the entire film. Japanese subtitles were given to the Japanese actors since their original dialogue differed greatly from the original script and were dubbed in English. Since the release of the film, Toho had adopted the moniker "King of the Monsters" for Godzilla, which has since appeared in official marketing, advertisement, and promotional materials. The film spawned a multimedia franchise consisting of 33 films in total, video games, books, comics, toys and other media. The Godzilla franchise has been recognized by Guinness World Records as being the longest running film franchise in history. Since his debut, Godzilla became an international pop culture icon, inspiring countless rip-offs, imitations, parodies and tributes. The original 1954 film is also largely credited, because of Eiji Tsuburaya, for establishing the template for Tokusatsu, a technique of practical special effects filmmaking that would become essential in Japan's film industry since the release of Godzilla (1954). Critic and scholar Ryusuke Hikawa stated: "Disney created the template for American animation, In the same way, (special-effects studio) Tsubaraya created the template for the Japanese movie business. It was their use of cheap but craftsman-like approaches to movie-making that made tokusatsu unique." Steven Spielberg cited Godzilla as an inspiration for Jurassic Park (1993), specifically Godzilla, King of the Monsters! (1956), which he grew up watching. TriStar Pictures released a reimagining of Godzilla (1998), directed by Roland Emmerich. Despite that Emmerich wanted his Godzilla to have nothing to do with Toho's Godzilla, he did maintain some elements from the original 1954 film, stating, "We took part of [the original movie’s] basic storyline, in that the creature becomes created by radiation and it becomes a big challenge. But that’s all we took." In 2014, Warner Bros. and Legendary Pictures released a reboot of the Godzilla franchise, directed by Gareth Edwards. Edwards stated that his Godzilla film was inspired by the original 1954 film, stating, "Godzilla is a metaphor for Hiroshima in the original movie. We tried to keep that, and there are a lot of themes from the '54 movie that we've kept." ^ In 2004, Rialto Pictures released the film in a limited theatrical run as Godzilla. In 2014, Rialto Pictures re-released the film in a limited theatrical run as Godzilla: The Japanese Original, to avoid confusion with Legendary's Godzilla film. In 2006, Classic Media released the film on DVD/Blu-ray as Gojira. In 2012, Criterion released its own remastered version on DVD/Blu-ray as Godzilla. ^ a b c d "Godzilla (1954) - The Criterion Collection". Criterion. Retrieved December 17, 2017. ^ Ryfle 1998, p. 33. ^ Ryfle & Godziszewski 2017, p. 84. ^ a b c Ryfle & Godziszewski 2017, p. 105. ^ a b c "Godzilla (Original Japanese Version)". Boxofficemojo. Retrieved February 14, 2019. ^ a b c "Godzilla: The Japanese Original". Boxofficemojo. Retrieved February 14, 2019. ^ a b Ryfle, Steve; Goldstein, Bruce (December 6, 2007). "Godzilla 50th Anniversary Pressbook". SciFi Japan. Retrieved April 6, 2018. ^ a b Goldstein, Bruce; Franklin, Dave (February 26, 2014). "Restored Original Godzilla Gets US Theatrical Release". SciFi Japan. Retrieved April 6, 2018. ^ Aiken, Keith (June 29, 2006). "Classic Media's Godzilla Summer". SciFi Japan. Retrieved October 11, 2017. ^ a b Aiken, Keith (November 18, 2011). "Godzilla from The Criterion Collection". SciFi Japan. Retrieved October 11, 2017. ^ Mayo, Robert; Cohen, Rachel (March 31, 2014). "Classic Media Reissues the Original Godzilla on DVD". Scifi Japan. Retrieved September 1, 2014. ^ a b "Jennifer Lawrence, Game of Thrones, Frozen among new entertainment record holders in Guinness World Records 2015 book". Guinness World Records. Retrieved February 26, 2016. ^ a b Ryfle 1998, p. 351. ^ a b Merchant, Brian (August 25, 2013). "A Brief History of Godzilla, Our Never-Ending Nuclear Nightmare". Vice. Retrieved June 9, 2018. ^ a b c Ryfle, Steve (Winter 2005). "Godzilla's Footprint". Virginia Quarterly Review. 81 (1): 44–68. ^ Allison, Anne (June 30, 2006). Millennial Monsters. University of California Press. pp. 45–69. ISBN 9780520245655. ^ Schnellbächer, Thomas (November 2002). "Has the Empire Sunk Yet? : The Pacific in Japanese Science Fiction". Science Fiction Studies. 29 (3): 382–396. ^ Rafferty, Terrence (May 2, 2004). "The Monster That Morphed Into a Metaphor". The New York Times. Retrieved June 9, 2018. ^ Jacobson, Mark (May 16, 2014). "What Does Godzilla Mean? The Evolution of a Monster Metaphor". Vulture. Retrieved June 9, 2018. ^ Martin, Tim (May 15, 2014). "Godzilla: why the Japanese original is no joke". The Daily Telegraph. Retrieved June 9, 2018. ^ Ragone 2007, p. 33. ^ a b c d e Ragone 2007, p. 34. ^ Ryfle 1998, p. 21. ^ a b c Ryfle 1998, p. 25. ^ a b c d Ryfle 1998, p. 24. ^ a b c d e f g h i Ryfle 1998, p. 27. ^ a b Ryfle 1998, p. 23. ^ Ragone 2007, p. 38. ^ a b c Ragone 2007, p. 39. ^ a b c d e f g h Ryfle 1998, p. 29. ^ Ragone 2007, p. 42. ^ Ryfle 1998, p. 178. ^ Kalat 2010, p. 17. ^ a b Lees & Cerasini 1998, p. 12. ^ Ragone 2007, p. 35. ^ a b c Ryfle 1998, p. 30. ^ a b c d e Ryfle 1998, p. 31. ^ Ryfle & Godziszewski 2017, p. 104. ^ Ryfle 1998, p. 34. ^ "Gojira (1957)". JP's Box-Office. Retrieved January 8, 2019. ^ Ryfle 1998, p. 55. ^ "Henshin!Online". Henshin!Online. Retrieved April 18, 2014. ^ "Godzilla: The Japanese Original Weekend Grosses". Boxofficemojo. Retrieved April 21, 2014. ^ "Godzilla: The Japanese Original theatrical schedule". Rialto Pictures. Archived from the original on May 6, 2014. Retrieved 2014-05-08. ^ Poole, W. Scott (2011). Monsters in America: Our Historical Obsession with the Hideous and the Haunting. Waco, Texas: Baylor. ISBN 978-1-60258-314-6. ^ Ryfle 1998, p. 37. ^ Ryfle 1998, p. 38. ^ Ryfle 1998, p. 47. ^ Galbraith IV 2008, p. 375. ^ "Gojira (1956)". Rotten Tomatoes. Fandango. Retrieved April 21, 2018. ^ "Godzilla (1954) Reviews". Metacritic. CBS Interactive. Retrieved April 21, 2018. ^ Tallerico, Brian (July 2, 2004). "GODZILLA Movie Review & Film Summary (2004) | Roger Ebert". Rogerebert.suntimes.com. Retrieved June 6, 2014. ^ "Review: The Criterion Collection's GODZILLA « SciFi Japan". Scifijapan.com. November 18, 2011. Retrieved June 6, 2014. ^ "The 100 Best Films Of World Cinema – 31. Godzilla". Empire. ^ Khatchatourian, Maane (June 12, 2015). "10 Best Monster Movies of All-Time". Variety. Retrieved August 6, 2015. ^ a b Ryfle & Godziszewski 2017, p. 106. ^ Kalat 2010, p. 29. ^ Molinaro, Max (November 5, 2014). "60 Years Of Godzilla: A History And Critique Of The Greatest Monster Movie Series In Cinema". PopOptiq. Retrieved May 4, 2018. ^ Ingoglia, Jesse (May 21, 2014). "Godzilla: Monster, Metaphor, Pop Icon". The New York Public Library. Retrieved January 27, 2018. ^ Patches, Matt (April 11, 2014). "Why Godzilla Remains Pop Culture's Immortal Monster (Opinion)". Hollywood Reporter. Retrieved January 27, 2018. ^ Pyzyk, Mark (May 6, 2004). "Hey Godzilla, Why Are You Such a Giant Cultural Symbol?". PopMatters. Retrieved January 27, 2018. ^ Kelts, Roland (June 12, 2013). "Preserving a classic Japanese art form: tokusatsu magic". The Japan Times. Retrieved January 27, 2018. ^ Ryfle 1998, p. 15. ^ Aiken, Keith (May 31, 2015). "Godzilla Unmade: The History of Jan De Bont's Unproduced TriStar Film – Part 4 of 4". SciFi Japan. Retrieved March 8, 2016. ^ Cheney, Alexandra (March 12, 2014). "'Godzilla' Director: The Film Takes Itself Very Seriously". Variety. Retrieved June 9, 2018. ^ Newitz, Annalee (July 25, 2013). "Godzilla director Gareth Edwards explains the symbolism of kaiju". io9. Retrieved June 9, 2018. Barr, Jason (2016). The Kaiju Film: A Critical Study of Cinema's Biggest Monsters. McFarland. ISBN 1476623953. Brothers, Peter H. (2015). Atomic Dreams and the Nuclear Nightmare: The Making of Godzilla (1954). CreateSpace. ISBN 9781508975830. Galbraith IV, Stuart (1998). Monsters Are Attacking Tokyo: The Incredible World of Japanese Fantasy Films. Feral House. ISBN 0922915474. Galbraith IV, Stuart (2008). The Toho Studios Story: A History and Complete Filmography. Scarecrow Press. ISBN 9781461673743. Godziszewski, Ed (1994). The Illustrated Encyclopedia of Godzilla. Daikaiju Enterprises. Lees, J.D. ; Cerasini, Marc (1998). The Official Godzilla Compendium. Random House. ISBN 0-679-88822-5. Rhoads, Sean; McCorkle, Brooke (2018). Japan's Green Monsters: Environmental Commentary in Kaiju Cinema. McFarland. ISBN 9781476663906. Ryfle, Steve (2006). Godzilla's Footprint - DVD Booklet. Classic Media. ASIN B000FA4TLQ. Solomon, Brian (2017). Godzilla FAQ: All That's Left to Know About the King of the Monsters. Applause Theatre & Cinema Books. ISBN 9781495045684. Wikimedia Commons has media related to Godzilla (1954 film).